Abstract: As its name suggests, MSI's R3870X2-T2D1G-OC videocard is the combination of two ATI HD 3870 GPUs on a single PCB to provide gamers with a ready-made crossfire gaming solution. In its unceasing war with nVidia for the hearts and pocketbooks of gamers around the globe, ATI/AMD's latest tactic is to shoehorn two of their powerful graphics processors into a single card, theoretically providing the performance of a dual-card crossfire or SLI setup at a smaller cost both in money and space. Today, PCSTATS is going to be examining the fruits of this particular tactic, in the form of the MSI R3870X2-T2D1G-OC Radeon HD 3870 X2 Videocard. As its name suggests, MSI's R3870X2-T2D1G-OC videocard is the combination of two ATI HD 3870 GPUs on a single PCB to provide gamers with a ready-made crossfire gaming solution. MSI has packed in 1GB of DDR3 VRAM, 512MB for each GPU, and as you might assume from the 'OC' portion of the nomenclature, the stock speed of the twin 3870 GPUs has been increased from their stock 825MHz to a respectable 860MHz out of the box. The boost in clock speed should help make this gamers’ card better at its intended purpose. The memory runs at the stock 900Mhz of all Radeon 3870-based cards. You should be able to find the MSI R3870X2-T2D1G-OC for about $325CDN, give or take, which essentially equals the current retail value of two 3870-based 512MB video cards. For about $650, you can get you a pair of these bad boys and put together a monster crossfire setup which should blast through any modern games toughest of benchmark scenarios. Just how well this configuration will perform, especially compared to ATI's newer offerings like the Radeon HD 4870 X2 is what PCSTATS is examining in detail later in the article. MSI's packaging for the R3870X2-T2D1G-OC consists of the expected massive cardboard box containing comfortingly stout molded foam inserts which nestle and protect the videocard quite capably, which is good considering the card's impressive size (more on that later). The hardware bundle is adequate, containing everything needed, including a pair of DVI-to-VGA adaptors (the MSI R3870X2-T2D1G-OC is a dual-DVI output card, as are all other modern high end video cards) and a DVI-to-HDMI dongle to take advantage of the 3870 chipset's ability to output HDMI video and audio signals. 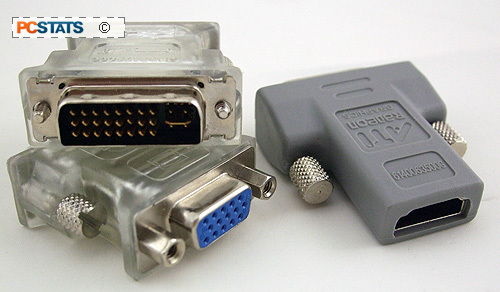 Also included are the expected component video output dongle, a crossfire connector bridge, a single 2x molex-to-PCI Express power adaptor and a 6-pin to 8-pin PCI Express power adaptor (more on these in a second). A quick start guide and driver CD round out the bundle. Note that no software of any kind is included, which seems a little chintzy, especially considering the HD 3870 X2's video playback abilities. As a high-end twin-GPU video card, the MSI R3870X2-T2D1G-OC is incredible power hungry! The card features two PCI express power connectors, one six pin and one eight pin. The included 6-pin to 8-pin adaptor suggests that the card only really needs 75Watts of power from each connector (the max from 6-pins), but you really shouldn't try to run this baby with less than a 550Watt PCI-express ready PSU. The fact that MSI only included a single Molex to PCI express power adaptor tends to reinforce this opinion. This is a modern card built for modern computers with modern PSUs, not an upgrade for your old clunker. More detailed power consumption info to come... anyone care to bet on power consumption? The MSI R3870X2-T2D1G-OC comes with DVI-to-HDMI and DVI-to-Analog video adaptors. The MSI R3870X2-T2D1G-OC is not a small video card, as you might expect. It is, in fact a very large video card, large enough that it might not fit comfortably in some smaller compact PC cases. It measures 27cm tip-to-tip, though MSI has thankfully placed the PCI express power connectors on the face of the card rather than the end, meaning you will not need additional space for cabling. 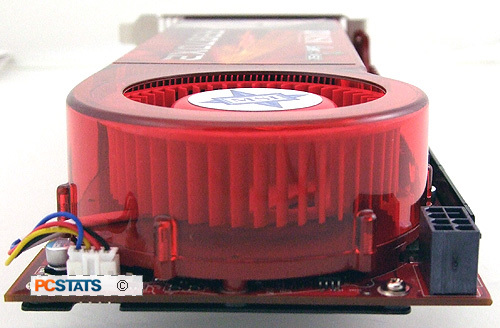 The fan is a 'squirrel-cage' type as found on just about all of today's high end video cards, and air is guided across the large red aluminum heatsinks by a shaped plastic duct. The two-slot cooling duct exhausts hot air out of the rear of the computer, while the heatsink covers all components including the video memory chips (though these are placed outside of the duct and thus the main airstream. The rear components are covered by a black aluminum sectioned heatsink, which is not directly connected to the front cooling solution. The cooling solution is very quiet, especially during 2D usage, where it is virtually silent. Fan noise is linked to both GPU temperature and load, meaning it can vary widely during use. In our experience it never got to a point we would consider loud except when artificially 'maxed' by software means. During testing, we noticed that the back of this video card got quite hot, we'd estimate in the 60-70 degree Celsius range. This is not unique to the MSI card though, as most of today's high-end video cards get hot in the same place. Two GPUs makes for two hot-spots though. 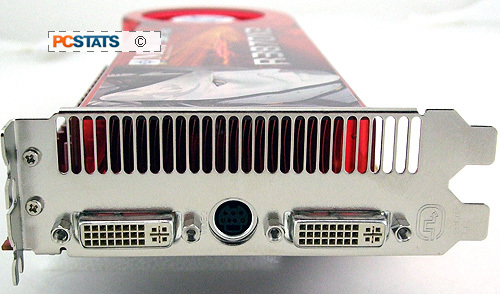 Dual DVI-connectors and a 7-pin Mini DIN for component and s-Video output make up the front face of the card. ATI's crossfire connector is present and accounted for, on top of the card at the immediate front. MSI's package for the MSI R3870X2-T2D1G-OC is good on the hardware front, as we mentioned above, but it would have been nice to see some HD or Blu-ray DVD playback software included, since the card is optimized for these technologies. A game or two never goes wrong either. Pg 13. Conclusions: HD 3870 X2 Still Competitive?